When you log in from an unusual location or there is some suspicion that you may be a robot based on your actions, then Yandex may flag your login attempt. 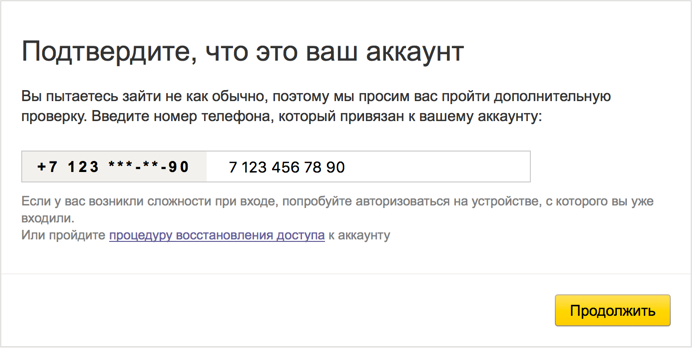 In this case Yandex will ask you to enter a CAPTCHA or contact information you linked to your account (like your phone number or email address). Hackers that don't know what email address or phone number you linked will not be able to log in to your account and Yandex will send you a notification every time there is a suspicious login attempt regardless. The Use another confirmation method button lets you verify your other email address instead of your phone number (if you confirmed an alternate email address). If you can't enter the contact information that's masked in the form correctly or restore access to your account, please fill out the Restore Access form. If you also can't send the form, please use the feedback form below to let us know.